Known for pushing the boundaries of New Pulp and Genre Fiction, Pro Se Productions announces the debut of an action packed thrill ride of a collection that also explores the depths of the human soul. Author K. M. Indovina joins Pro Se Productions with her horrifying and insightful short story volume- THE REMNANT AND OTHER TALES. It is said that a Hero hides in every person. But a Villain also waits in each heart, ready to strike. Which a person becomes is determined by many things, including the whim of external forces around them and the choices they make. K M Indovina explores this aspect of humanity, the fickle line between good and evil and the vast gulf of gray between the two in her short story collection- THE REMNANT AND OTHER TALES. From regular people to masked vigilantes and beyond, Indovina tackles the question of what makes us good or evil and more importantly, which one makes us more human? Horror, Adventure, Romance, and more await in THE REMNANT AND OTHER TALES by K M Indovina. From Pro Se Productions. 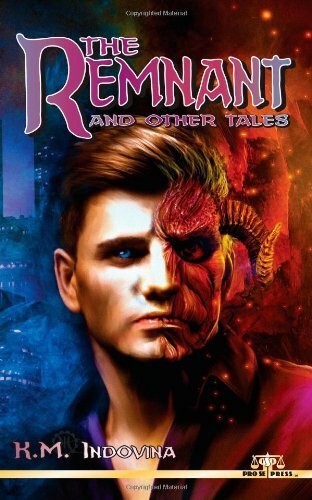 Featuring a haunting cover by artist Jeff Hayes and cover design and print formatting by Percival Constantine, THE REMNANT AND OTHER TALES is available at Amazon and at Pro Se’s own store at http://tinyurl.com/obfvezb for $9.00. The novel will be available in a matter of days as an Ebook on Amazon, Barnes and Noble, and Smashwords.